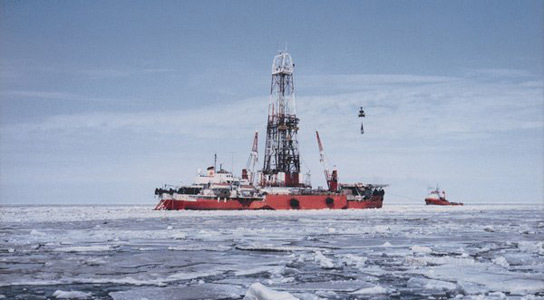 In the Arctic Circle, on the continental slope off Canada in the Beaufort Sea, the shallowest known deposit of methane hydrate has been discovered. The crystalline solid is comprised of methane molecules trapped in an ice-lattice structure. The scientists presented their findings at the annual meeting of the Geophysical Union in San Francisco, California. The trapped gas deposit is located just 290 meters below sea level. Previously, the shallowest deposits were found in the vicinity of the Svalbard Islands, in the Gulf of Mexico, at a depth of around 400 meters. The newly discovered deposit is of modest size, but such trapped deposits represent a large global carbon reservoir and some researchers fear that their destabilization around the world, caused by changes in sea temperature or drilling, could cause a release of methane into the environment and accelerate global warming. Even a subtle warming makes this new deposit makes it vulnerable to decomposition, since it is at such a shallow depth. The deposit is within the “methane hydrate stability zone,” a range of pressure and temperature at which gas hydrates are stable. The stability zone begins at a depth of about 270 m in this region, above sea temperatures are too warm to ensure that the methane remains locked. Some climate scientists fear that gas-hydrate decomposition could destabilize the sea floor, causing landslides and tsunamis. Other scientists remain skeptical, since there is no proof in the geological record that any of that has ever happened before. 4 Comments on "Shallow Undersea Methane Hydrate Deposit Found in Arctic"
So…..WHY oh WHY dont we harvest the damn gas and use it for something productive?? I am sure that Shell and others would “harvest the damn gas” if the technology was available to do it. It strikes em that there may be very little risk of this methane escaping as methane. If the ice crystals melt gently as presumably they would, as sea temperatures rise gradually, the methane will bubble up through the sea and be biologically oxidised in the ocean, providing a carbon source for increasing life in the sea. There would be a CO2 rise impact but not the much bigger (about 23 times bigger) greenhouse effect of methane emissions. I say this from experience of the remarkable ability of soil microbess to oxidise landfill gas methane, which I have seen, as it passes through the soil (or an engineered biofilter) BEFORE it reaches the air above.